These stick sculptures can be any size you would like. The image above was created by approximately 40 little artists who each painted 2 sticks. The more sticks you give each artist, the larger the finished sculpture. Give your little artist a few craft sticks and markers. Encourage them to draw any design they would like on their sticks. After they have finished drawing with markers on their sticks, set out the liquid watercolors. Little artists can apply the paint with paintbrushes or eye droppers. Add liquid watercolor on top of marker drawings, or keep marker drawing sticks and painted sticks separate. After the paint has dried, it is time to assemble the stick sculpture. Randomly stack and connect sticks using basic classroom glue. It may help to begin by making an “X” shape or a triangle shape with 2-3 sticks, then adding additional sticks at interesting angles. This project can easily be extended over multiple days or even weeks. Let your little artist draw or paint on one or two sticks a day and slowly add to the sculpture over time. Metallic liquid watercolors and glitter glue can be used to give this project an extra sparkle. 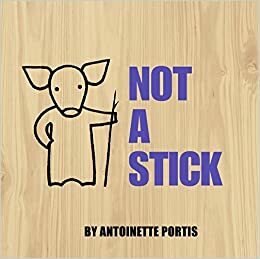 Before or after your stick sculpture project, read the book Not a Stick by Antoinette Portis together with your little artist.